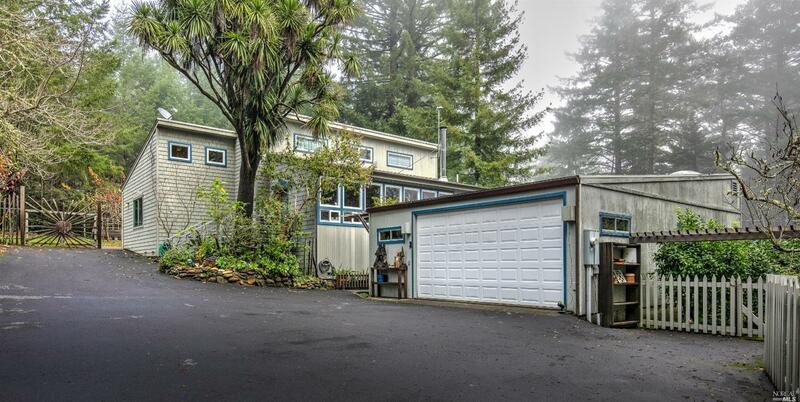 Charming single level home located on the Gualala Ridge. Solarium style entry with slate floors, lots of glass & stone wall. An open country style kitchen with stainless steel appliances and good storage. The home office has a built in Murphy Bed for extra sleeping. Established Fruit Salad of trees! Apple, pear, fig, cherry, apricot, tangerine, lemon & lime! The paved driveway leads to oversized detached garage with good storage & it's heated! Kitchen: Cntr Ceramic Tile, Dishwasher Incl., Gas Range Incl., Refrigerator Incl.